On Saturday, Nov. 12, Kane County ARES conducted a ‘Deployment Challenge’ exercise. The purpose of the exercise was to test our readiness to provide support for emergency situations that would require mobile deployment. 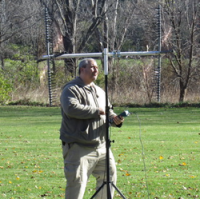 Members of the group assembled at a local forest preserve and assembled several different amateur radio stations on the VHF/UHF and HF amateur radio bands. After assembling the stations, we tested them by attempting various types of transmissions. Our VHF/UHF stations were able to communicate in digital modes and to reliably connect with other stations at distances up to 30 miles. Our HF stations were able to monitor other stations throughout the Midwest, and we successfully sent email through the WinLink system. This exercise was both challenging and interesting, and helped us practice our skills for future emergencies. Kane County ARES holds training sessions on the 2nd Thursday of the month and our regular meetings on the 4th Thursday of the month at the St. Charles Fire Dept Bldg, 112 North Riverside, Saint. Charles, IL. Both meetings begin at 7 pm. Enter on the north side of the building. In April, 2019, we will hold our training meeting on the 11th and the regular meeting on the 25th.